So with the New Year on the horizon, once the Christmas rush is out the way I'm determined to knuckle down and tick some of these off. 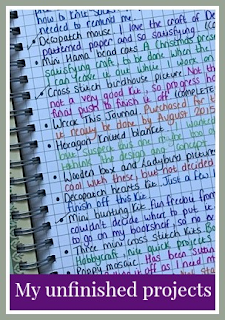 Here's my list, and with a bit of luck this time next year I'll be writing an update post with some of them completed! I'm starting near the bottom of the list with my Sky Blanket. Just because I don't want to lose momentum on it, it would be nice to have it finished as early into the New Year as possible. Making the border is going to be a lot of work! Next I intend to move onto my Crochet Pink Bunting. Again it's at the bottom of the list, but it's been hanging around for a while and I really want to get it finished, I know that it won't take too long. The Hexagon Knitted Blanket on my list was replaced with the Granny Square Crochet Blanket, and I used up all the yarn that I'd set aside. I do however have a little pile of knitted hexagons so I need to find a project for them, perhaps a cushion cover or something smaller, as it's a shame to waste them and I can't face unpicking them all. The Mini Hama Bead Cats are a project that I definitely want to get going with as I received them a while ago. It's a really lovely kit and I want to make a framed picture with it. I think I've been putting it off because I know that it will take a little while to complete and the mini Hama beads are very fragile when they are a work in progress! It might be a good one to work on over the Christmas period if I can find somewhere out of the way to store it. The Poppy Mosaic kit also needs finishing. It's a lovely kit and matches my sunflower mosaic, so it would be nice to get it finished for the summer so it can go outside. I was delaying it because I needed some mortar and concrete, but I think I've got that sorted now so there is no excuse. It needs to be done outside really so perhaps when the weather starts to warm up a bit. I have a lovely Wooden Box and some Ladybird pictures from an old book which fell apart. I really want to use the pictures to cover it and make it look prettier. The pictures would also be good for brightening up lots of other things like my Ikea magazine holders, I really want to get them out on display! A new project to add to the list is something to fill this Ikea frame that I picked up a few weeks ago. I'm thinking a seashell picture, perhaps painting the frame or the background in pale blue, or several different shades of blue, then filling with some of the seashells from my collection (I have quite a few) glued onto the background. I'd like to have more beach themed decor around, considering that we live so close to the sea. I'm hoping that writing this post will give me the motivation that I need to get these projects finished - check back for an update hopefully not too far in the distant future! What do you have on your unfinished projects list?